Some of the tallest waterfalls in the world can be found in Sunndal in Møre og Romsdal, along with a magnificent and unique natural phenomenon in Åmotan. This attraction is still fairly unrecognised by Norwegians, but has become a favourite among Dutch tourists. Åmotan in Jenstadjuvet south of Gjøra in Sunndalen is an area with steep mountain peaks, moorlands and terraces that create an intricate river system where five waterways meet. Three of the rivers form magnificent and lush waterfalls down towards Åmotan, offering an extraordinary natural attraction. 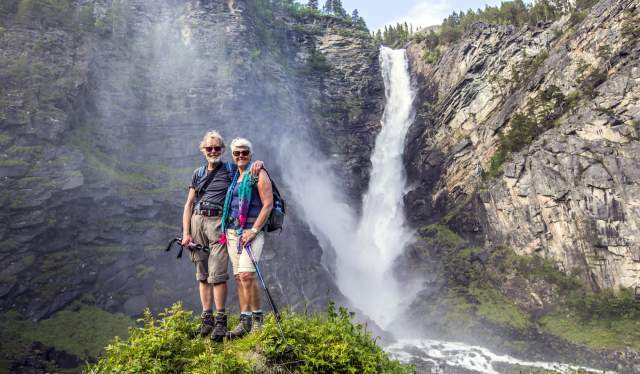 Each of the three falls is remarkable in its own right: Reppefallet and Lindalsfallet, which have a freefall of 110 metres, the 156 tall Svøfallfallet. What makes Åmotan so spectacular, however, is the combination of the three falls together in action. "It&apos;s a very special sight, even if I think Lindalsfallet is the most beautiful waterfall. It looks like an American canyon", says the guide Anders Hovde. Guided waterfall walks are available every Thursday in July and August. It is a three-hour long adventure that departures from Sunndalsporten on Gjøra. The area is well sign-posted. Those who prefer to explore Åmotan on their own will find more information here. "Every year, 5,000-6,000 tourists visit Åmotan, although the place seems to be more famous in Europe than in Norway - more than half of the tourists are from abroad”, Hovde says. One reason is that Åmotan has been featured in several foreign blogs and websites. "We have read and heard so many exciting things about Åmotan that we just had to see it", exclaims Bert and Marie Jeanne Hogenberg, two pensioners from the Netherlands. And it's really amazing!" The Hogenbergs are caravanning in Norway, and Åmotan was a given stop on their itinerary. The best way to experience Åmotan is to go down the gorge. Getting close to the falls, hearing the roaring water and feeling the force is an experience you will cherish for life. Just remember to be careful. Wear sturdy hiking shoes and follow the signposts. You cross the rivers on bridges, and be aware that there is a safety chain in the steepest part. Until 1953, children from Lundli south of the gorge passed the area on their way to school. 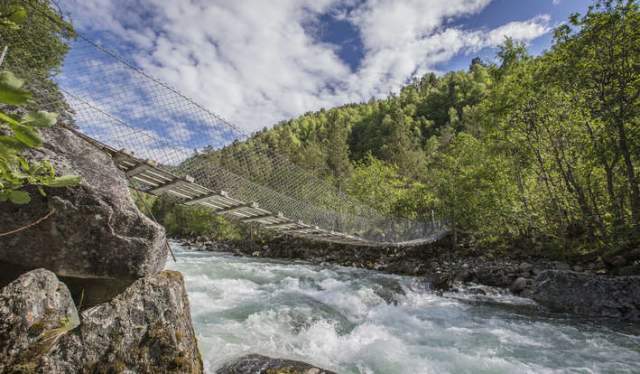 To reach the school at Svisdal, they had to go down a steep trail, cross the river on a narrow, rocky suspension bridge, and continue up another steep hill. The numerous waterfalls in Sunndal are in the process of being mapped by Sunndal National Park Center. The aim of the project is to put the spotlight on all the beautiful waterfalls in the area. 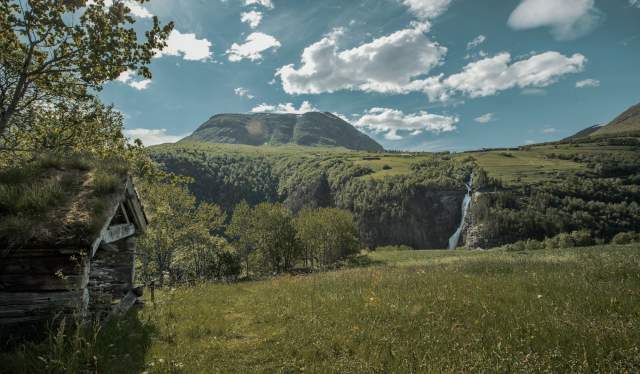 "At the moment, nobody knows how many waterfalls there are in Sunndal, but soon we will have a good idea," Gunn Signe Aarnes at Sunndal National Park Center says. Many of the waterfalls are already known, of course, and some of them are in the top 10 largest waterfalls in the world. The most famous is Vinnufossen, also known as Vinnufallet, just east of Sunndalsøra. According to the World Waterfall Database , this waterfall has the highest freefall in Europe. Vinnufossen consists of four separate falls, the longest of which is an impressive 420 metres.